When the Argentine economy collapsed in 2001, many were surprised by the factory takeovers and neighborhood assemblies that resulted. But workers’ control and direct democracy have long histories in Argentina, where from the late nineteenth century and well into the twentieth, anarchism was the main revolutionary ideology of the labor movement and other social struggles. Most histories of anarchism in Argentina tend toward dry analyses of labor politics, lists of union acronyms, and the like. For Juan Suriano, that’s just one part of the story. Paradoxes of Utopia gives us an engaging look at fin de siècle Buenos Aires that brings to life the vibrant culture behind one of the world’s largest anarchist movements: the radical schools, newspapers, theaters, and social clubs that made revolution a way of life. Cultural history in the best sense, Paradoxes of Utopia explores how a revolutionary ideology was woven into the ordinary lives of tens of thousands of people, creating a complex tapestry of symbols, rituals, and daily practices that supported-and indeed created the possibility of-the Argentine labor movement. 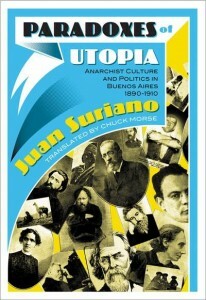 Without partisanship or didacticism, Suriano creates an innovative panorama that gives equal weigh to the strengths and weakness of anarchism in Argentina, effective strategies and grave mistakes, internal debates and state repression, all contextualized within the country’s broader political, economic, and cultural history. This entry was posted in Book Reviews, Latin American radicalism, Translations by Chuck Morse. Bookmark the permalink.